Percival Goodman (January 13, 1904 – October 11, 1989) was an American urban theorist and architect who designed more than 50 synagogues between 1948 and 1983. He has been called the "leading theorist" of modern synagogue design, and "the most prolific architect in Jewish history." Percival Goodman was born in New York City to wealthy parents who were artists. His brother was the noted writer and sociologist Paul Goodman. 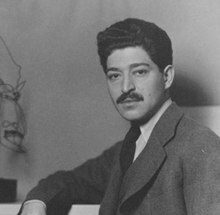 In 1925, Percival Goodman received the Society of Beaux-Arts Architects Paris Prize which sent him to the École des Beaux-Arts in Paris, France for architectural training. In the earlier part of his career, Goodman designed department store interiors, apartments, and country houses. He also had an interest in urban planning: he submitted a 1930 proposal for the Palace of the Soviets in Moscow, and proposed a master plan for Long Island City. He was an early critic of Robert Moses' parkway plans for New York City, preferring to "improve the center and make livable neighborhoods"; he also criticized the garden city movement of Ebenezer Howard and the Ville Radieuse of Le Corbusier. Goodman called himself "an agnostic who was converted by Hitler", and after World War II he became more interested in Jewish architecture. At a 1947 conference of the Reform Jewish movement, the Union of American Hebrew Congregations, Goodman advocated the use of modern architecture for new Jewish buildings, rather than following the models of older churches and synagogues. He quickly began to receive commissions. Many of these were for new buildings in suburban areas reachable only by car, and Goodman responded by using a variety of designs intended to attract motorists' attention. In 1949 his proposal was selected for a large Holocaust memorial in Manhattan's Riverside Park, but it was never built. His student Peter Eisenman much later completed a Holocaust memorial in Berlin, the Memorial to the Murdered Jews of Europe. His design for B'nai Israel in Millburn, New Jersey (1951) has been called "the first truly modern synagogue". Goodman's design for B'nai Israel included sculpture, painting, and ark curtain design by Herbert Ferber, Robert Motherwell, and Adolph Gottlieb, respectively. This integration of modern sculpture and artworks, along with the use of natural light, became hallmarks of Goodman's work. One critic wrote that Goodman "stressed the human scale in his prayer halls and collaboration with modern artists where expressive symbolism was warranted." Percival Goodman was also considered a distinguished urban theorist. He was the co-author, with his brother Paul, of the landmark urban planning text Communitas, and he illustrated editions of a number of his brother's other works. Percival Goodman was a fellow of the American Institute of Architects. He was a professor at the Columbia University architecture school for more than 25 years, where notable students included Peter Eisenman. In 2001, Columbia exhibited a retrospective of his works at its Wallach Gallery. Illustrator for various books by Paul Goodman including: Parents Day; Don Juan: Or, The Continuum of the Libido; and Stop-Light: Five Dance Poems. ^ a b Philip Nobel, Art/Architecture; What Design For a Synagogue Spells Jewish?, New York Times, December 2, 2001. ^ a b c Michael Z. Wise, "America's Most Prolific Synagogue Architect Archived 2011-07-14 at the Wayback Machine," The Forward, March 9, 2001. ^ a b Paul Goldberger, Percival Goodman, 85, Synagogue Designer, Dies, The New York Times, October 12, 1989. ^ George James, Places of the Heart; Historic Houses of Worship, From Soaring Spires to Simple Quaker Meeting Houses, The New York Times, March 28, 1999; see also Matthew Baigell, Jewish Art in America: An Introduction, p.108 (Rowman & Littlefield, 2006). Percival Goodman architectural records and papers, 1929-1989, held by the Department of Drawings & Archives of the Avery Architectural & Fine Arts Library, Columbia University. Percival Goodman, Kimberly Elman, Angela Giral, Percival Goodman: Architect-Planner-Teacher-Painter (Princeton Architectural Press, 2001). This page was last edited on 7 July 2018, at 00:55 (UTC).